In 2014, Mayor de Blasio unveiled “Housing New York: A Five Borough, Ten-Year Plan”, announcing the ambitious goal of building and preserving 200,000 affordable housing units. The Mayor’s office boldly states that the city has reached a “crisis of affordability” and that “things must change”. In a time of “crisis” our team firmly believes that innovation is needed and that the city cannot rely on one-off projects or piecemeal rezoning; a strategic and fresh approach is critical. 9x18 is a study of how current parking requirements in the NYC zoning regulations have manifested in underutilized space and problematic urban design, and it asks whether challenges to the code could create new potentials for affordable housing. 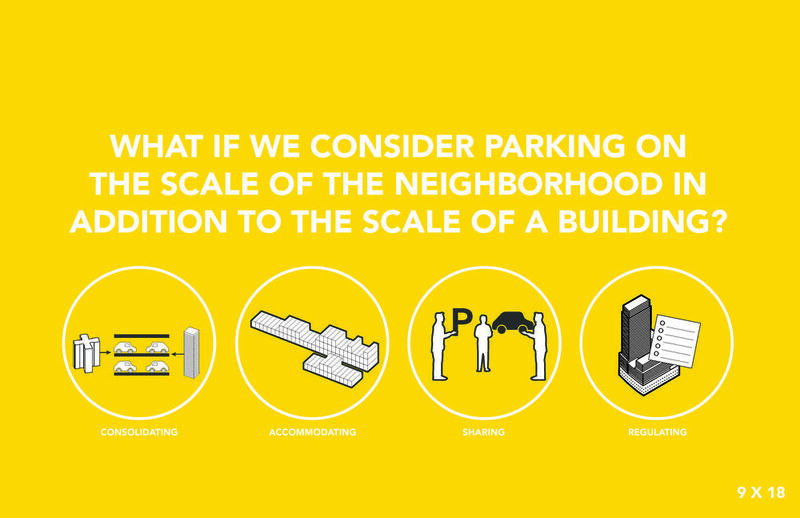 We propose revisions to existing zoning regulations that reflect a fine-grained approach to parking requirements. 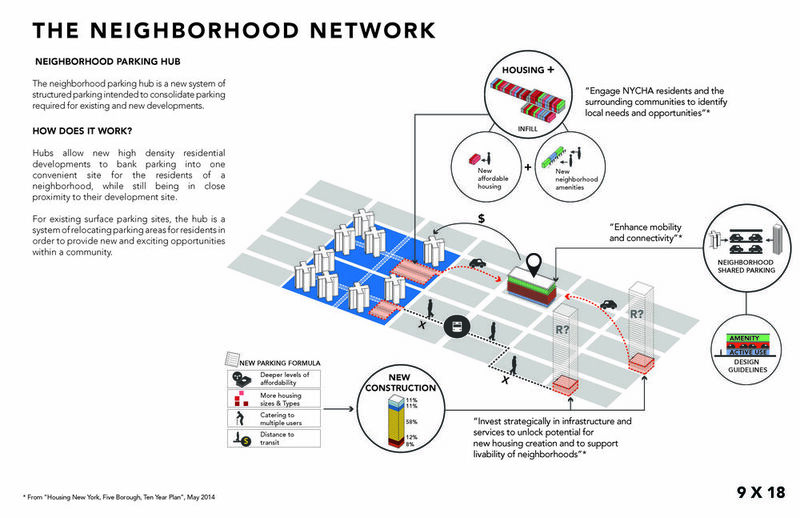 The project also strives to reveal the enormous potential of existing surface parking lots on New York City Housing Authority (NYCHA) land in strategic locations throughout the city as an untapped resource for development. There are 20,360,000SF (or 4,674 Acres) of surface level parking on NYCHA sites citywide, much of which is vastly under-utilized. Our project considers several ways that this land can play a role in addressing the affordable housing crisis by reducing the burden of parking requirements on private developers, and generating revenue to help preserve affordable housing on NYCHA sites. At the same time, strategic infill developments present opportunities to better integrate NYCHA sites into the surrounding urban context and neighborhood. In our work, we have visualized an analysis of existing zoning regulations and proposed fine-grained alternatives that consider the size and type of unit, proximity to transit, the level of affordability, and other relevant factors to further refine parking regulations in new construction. 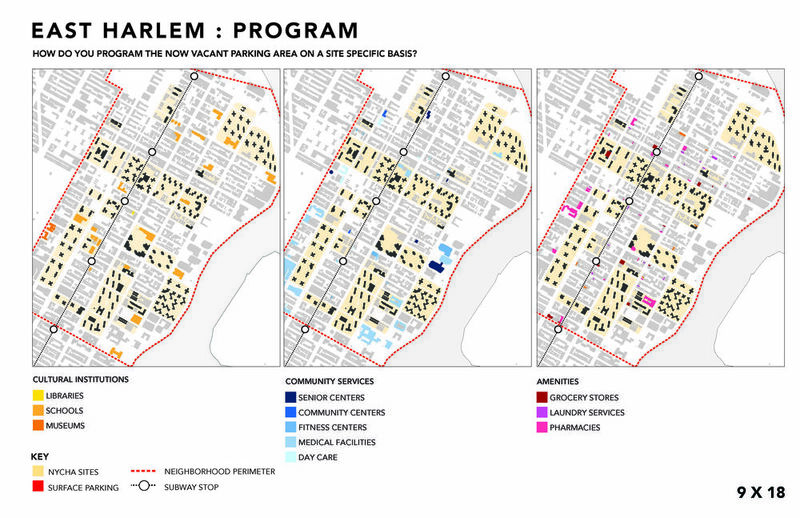 In tandem, we have conducted a citywide analysis of NYCHA’s surface parking lots to emphasize its potential for change throughout the city. The project then takes a closer look at East Harlem as a case study to illustrate how a design and planning intervention could have an impact at the scale of a building, a block and a whole neighborhood. Here we propose to bank surface parking from existing NYCHA campuses and new developments across the neighborhood into municipal parking structures in order to free up surface parking sites for future development. These locations provide opportunities to construct additional affordable housing units while providing needed cultural and community facilities, resident services, and other creative programming to service NYCHA residents and the surrounding community. The “need” for parking isn’t part of the popular discourse around housing in general and affordable housing in particular. We think that bringing parking into the discourse will engage major stakeholders: private developers, residents, government officials, social groups and NYCHA officials. Building consensus around the importance of neighborhood planning and the role that each stakeholder plays will influence how each might benefit from being part of a strategic plan to re-envision the future of housing in NYC. Folding NYCHA into the discussion is politically complicated but it represents an important social and urban asset and affords the potential to have a citywide impact. In the long term, we strongly believe that the 9x18 approach could and should be implemented. 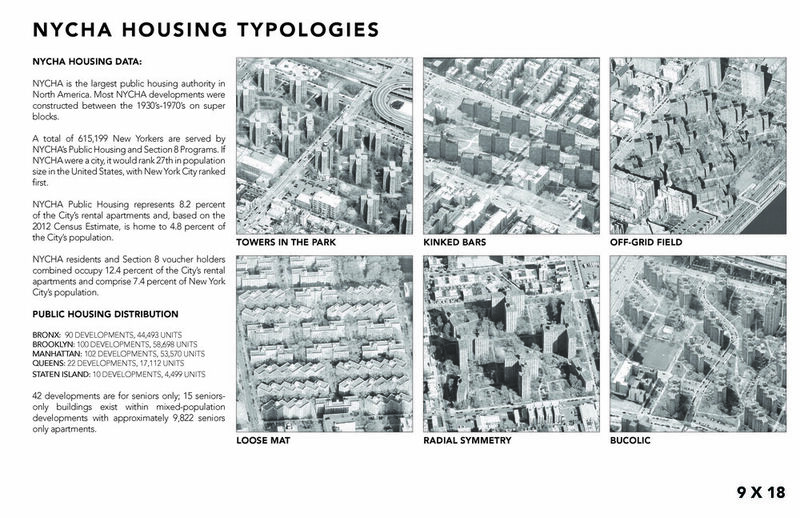 Adopting the 9x18 approach could create new potentials for affordable housing development citywide. At the same time, the project proposes that we embrace this moment of change to generate a conversation about lifestyle and urban priorities.